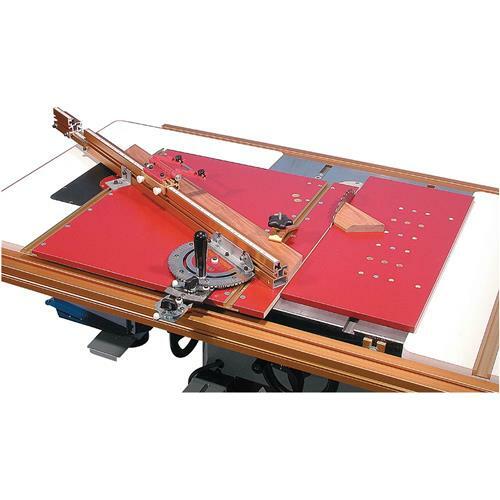 Capitalizing on a great idea, the folks at Incra® have combined their highly successful Miter 3000 with the exclusive AngleLOCK Indexing System with a sled system for the table saw. The sled with T-track and clamping fixture secures the workpiece as one solid unit for precision cross-cutting at any angle. The right-hand portion of the sled, once cut, secures to the right miter slot of your table saw by means of a miter slider and functions as a zero clearance cut-off table that's perfectly aligned with the main sled. Since this system includes precision angle adjustment, stop positioner and clamping sled for superior workpiece control, all possibility for cutting error has been eliminated and each cut is predictable and precise. Finally, a perfect cross-cutting system for your table saw! Order the Replacement Panel (H3602) for maintaining zero clearance for different blades and compound angle cutting.